niquely designed for each port, the new tours provide guests with the opportunity to explore local food markets in small groups, side-by-side with an expert chef. Oceania Cruises president Kunal S. Kamlani said: "It was ground-breaking when Oceania Cruises introduced the first hands-on culinary school at sea with the launch of Marina. "Now with the introduction of sister-ship Riviera we are taking culinary enrichment to a whole new level to solidify our reputation as the cruise line for epicureans." As a part of the Culinary Discovery Tours, guests may visit an artisanal cheese maker, chocolatier, wine vineyard or a fish market. Tours also incorporate mini-lectures, demonstrations or lunch before returning to the ship's Bon Appétit Culinary Centre for a cooking class drawing inspiration from the local market. Oceania Cruises culinary enrichment director Kathryn Kelly said: "In Athens, guests will visit the Agora meat and fish market followed by lunch in the Plaka. "When in Barcelona, we enjoy a Spanish olive oil tasting, shop at Santa Caterina Market and then finish the day with lunch at a top tapas restaurant." As well as the off-shore excursions, Riviera features 10 dining venues on board - six of which are gourmet restaurants - plus La Reserve by Wine Spectator, a professional facility for wine tastings and pairing dinners. Oceania Cruises has also this week named one of America's most famed Chefs, Cat Cora, as godmother to Riviera. Cora will name the ship in Barcelona at a lavish, invitation-only christening ceremony on May 11, which will culminate with a 15-litre Nebuchadnezzar of champagne, custom-made by Veuve Clicquot Ponsardin, commemoratively breaking against the hull of the 1,250-guest ship. Culinary Discovery Tours will launch in Europe aboard Riviera and Marina and can be booked prior to departure. The program will roll out in Asia, South America and the Caribbean in winter 2012-13. Prices start at US$175, including the escorted market tour and cooking class. Following her May 16 maiden voyage, Riviera will spend the summer and fall cruising the Mediterranean and then cross the Atlantic to operate a series of winter Panama Canal and Caribbean cruises.Marina is due to sail into Sydney for the first time in May 2013. The Bon Appétit Culinary Center on Oceania Cruises' Rivieraand Marina features 24 fully equipped work stations. Induction cook tops and convection ovens afford participants the opportunity to gain a hands-on cooking experience. Classes cater to all levels of aptitude, from beginner to master-chef level. On the line's smaller ships - Regatta and Nautica - Culinary Discovery Tours will combine excursions to local markets with hands-on cooking experiences at a shore-side cooking school or a well-known restaurant kitchen. In Istanbul, as an example, guests will follow their tour with a cooking class at Cooking Alaturka. New classes for the Bon Appétit Culinary Centre include Oceania Highlights, which features favourite recipes from Oceania Cruises' signature restaurants: Jacques, Red Ginger, Polo Grill and Toscana; Healthy Cooking, inspired by the line's collaboration with Canyon Ranch; and Emerging Cuisines, focusing on Moroccan, Peruvian and Asian-fusion dishes. For 2012, the culinary centre will introduce one-hour classes that focus on "hot topics" in the culinary world, including Beyond Brie: the Innovative Cheeses, where guests learn how to assemble a cheese plate or Favourite Pairings with Favourite Foods, which showcases innovative finger foods paired with cocktails and beer. Additionally, the curriculum will feature a new series of technique classes based on Jacques Pépin's new book, Essential Pépin. Beginner classes focus on basic knife skills, French sauces and proper technique for cooking fish. Advanced classes concentrate on the sous vide and pressure cooking methods. Guests enjoy wine tastings with every class and leave with a packet of recipes to bring home. Two-hour cooking classes are priced at US$69 and one-hour classes start at just US$39. Chef Kelly, along with Fleet Corporate Chef Franck Garanger, have recruited master chefs from Greece, Italy, Ireland, France, Australia, Vietnam, New Zealand, Peru and India, to join the culinary centre team on Riviera and Marina in 2012. Oceania Cruises is introducing Cuisines of the World programming fleet-wide. With each new port, the Grand Dining Room and Terrace Café will feature the culinary highlights and local signature dishes from that country. In addition, the ship's daily newsletter will highlight port-specific food facts, provide cuisine recommendations and offer other tidbits of gastronomic knowledge. 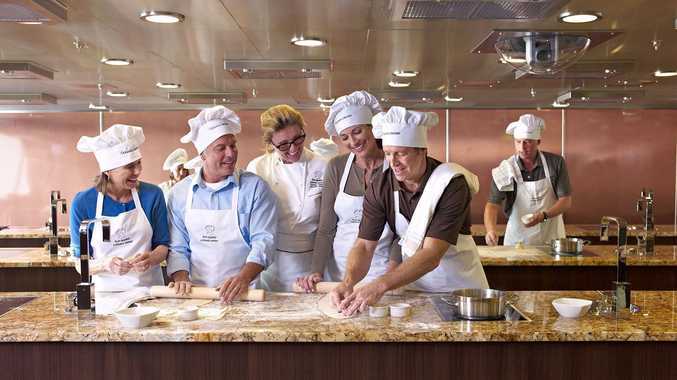 During most voyages, guests can also attend cooking demonstrations in the ship's main lounge. These cooking demos will highlight a particular method of cooking, a "mystery" ingredient from a recently visited market or one of the signature dishes from an Oceania Cruises' restaurant. Demos are open to all passengers and free of charge. For more information visit: Oceania Cruises.